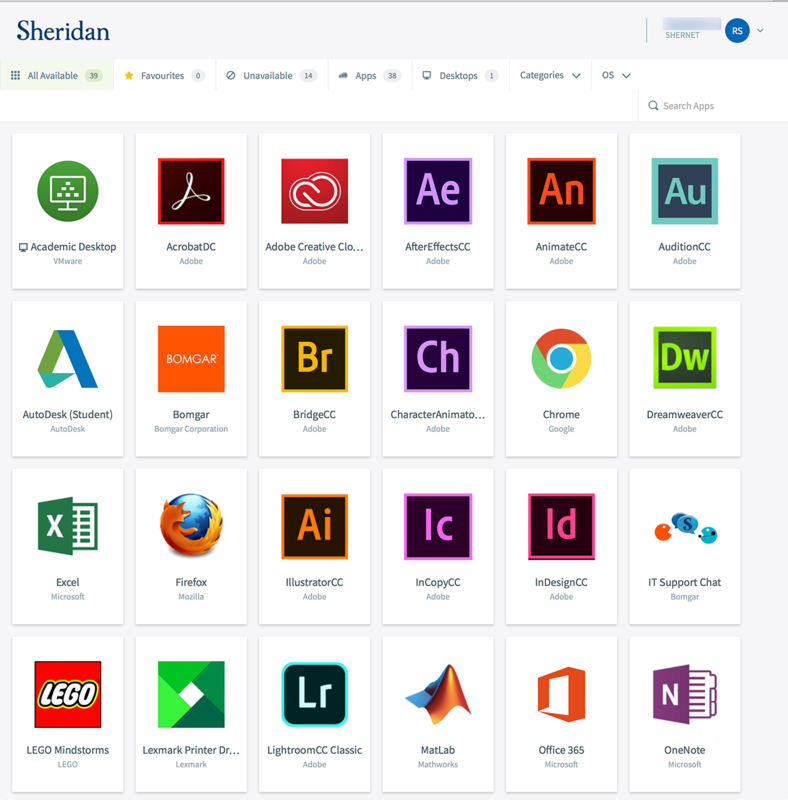 AppsAnywhere is Sheridan's new software distribution portal, replacing the the former software installation system that was available via AccessSheridan. AppsAnywhere provides all Sheridan students and employees an easy way to access software, on demand, through a web browser. How do I get software through AppsAnywhere? 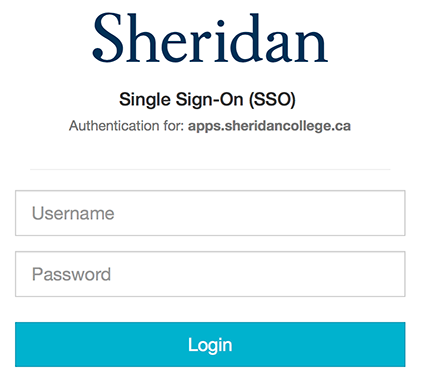 Follow the AppsAnywhere link and log-in with your Sheridan credentials to get started. 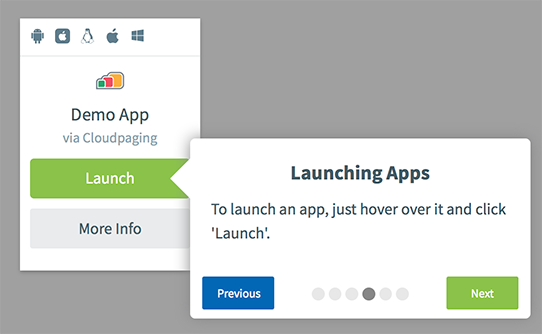 The first time you launch the AppsAnywhere web page you will have the option to step through a brief tutorial. 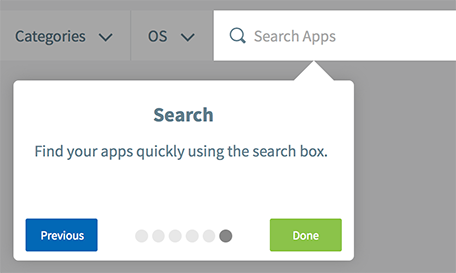 Click the Get Started button to begin or you can click the Skip the tour link to view the apps that are available to you. The information in the tutorial is captured below for your reference. Following the tutorial, or if you chose to skip it, you will see the prompt as shown below. For first time use, click the button labelled, "It's my first time using AppsAnywhere on this device. Let's go." 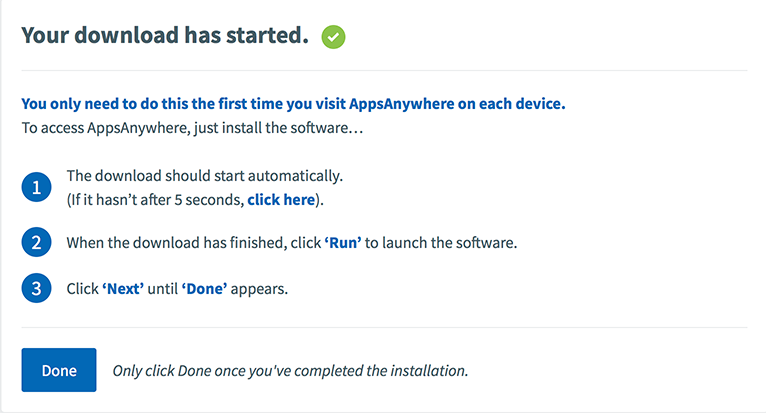 The AppsAnywhere client installer will begin downloading automatically to your device. Once the download is complete launch the installer and follow the steps as indicated. Click the Done button as shown in the snapshot below once the installation is complete. You will be prompted to allow the AppsAnywhere page to open. Click Allow. You will now see a listing of all the apps you can access. Note that not all apps are available to all users. 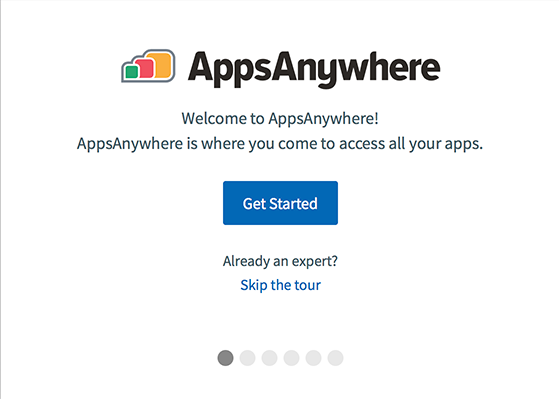 How is software delivered through AppsAnywhere? 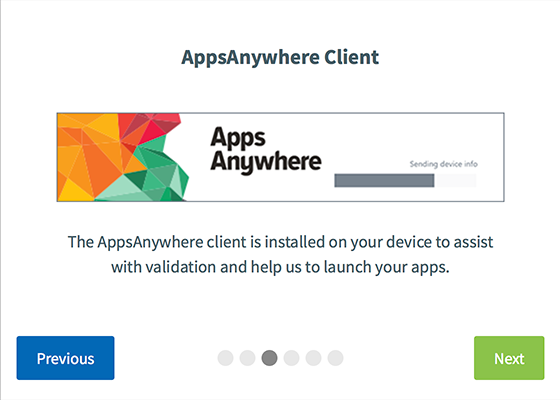 When you move your mouse over an app's icon on the AppsAnywhere screen you will see how an app will be delivered. 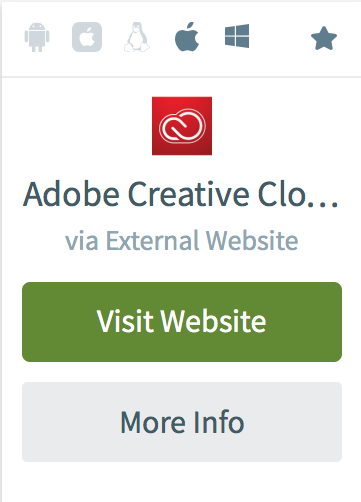 In the example below, moving your mouse over the Adobe Creative Cloud icon will reveal that you need to visit the Adobe website to get the software. No, OnTheHub is still a valid resource for some software and some of these titles (e.g. Microsoft Windows for students) will be listed on AppsAnywhere but delivered via OnTheHub. Visit the OnTheHub page for more details. In the past, no cost licenses for Microsoft Windows were available to students from OnTheHub. Is this still the case? Yes. Sheridan students can continue to download free versions of the Microsoft Windows operating system from OnTheHub. AppsAnywhere works with most modern web browsers including recent versions of Chrome, Edge, Firefox, Safari and Internet Explorer. No. You must have an active internet connection to access AppsAnywhere and download software. However, once you have downloaded the software to your device, in most cases, you will be able to use the software offline. See the More Info link associated with an individual software title and take note of any restrictions or dependencies. What software is available from AppsAnywhere? 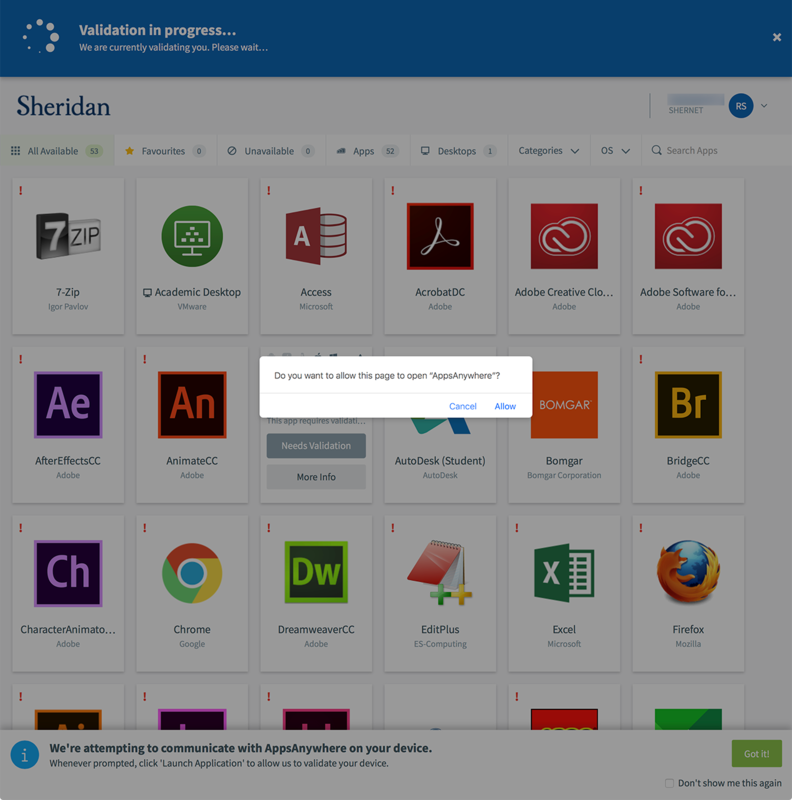 All applications that were formerly deployed via Access Sheridan’s “Software Installation” page can be found in AppsAnywhere. Popular software titles such as Microsoft Office and those found in the Adobe Creative Suite (e.g. Photoshop, Dreamweaver, Acrobat) are among the many titles you will be able to access. Specialized software for students in specific programs or software for employees with particular job functions can also be found here. You will also find campus resources such as printer utilities. Note that you will not see all of the available software titles – only those that are available to you. If you have questions about the availability of software, contact the IT Service Desk. Software that used to be available to me on the Software Installation page in Access Sheridan is not available on AppsAnywhere – what's up with that? In some cases, software can be retired or licensing agreements may have changed. 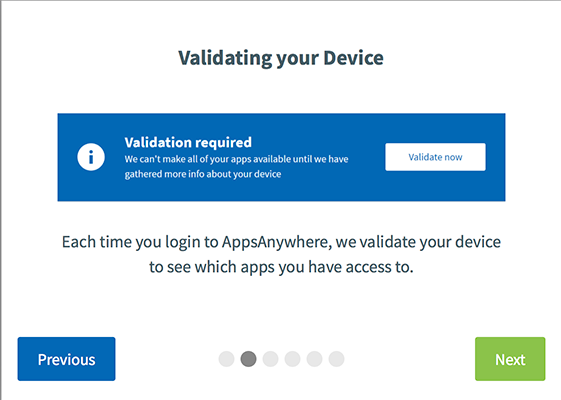 Sometimes you will find an app listed under the 'unavailable' tab on the AppsAnywhere web page and find that is restricted to you because of hardware or operating system requirements, licensing/delivery conditions, or other determining factor. Check the more info button associated with an app for details. If you have questions, contact the IT Service Desk. How can I have a software title listed on AppsAnywhere and made available to others (e.g. a class, employee group or select individuals)? Contact the IT Service Desk and an IT staff member will work with you on your request. Are there any restrictions on the software that I get from AppsAnywhere? Access to some resources may be on a term to term basis and sometimes there is a limit to the number of devices you can run the software on simultaneously. 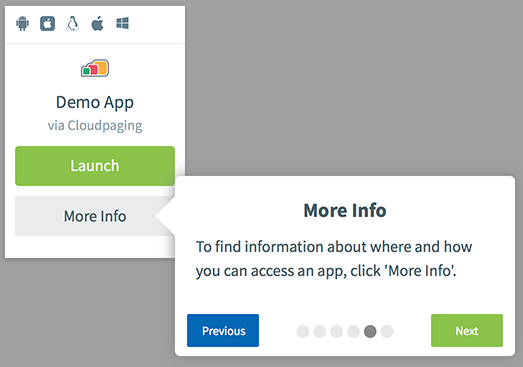 The more info button associated with each title listed on AppsAnywhere will reveal any specific restrictions. This 30 second video describes the benefits of using AppsAnywhere to deliver applications. The video transcript is available by following AppsAnywhere Video Transcript.